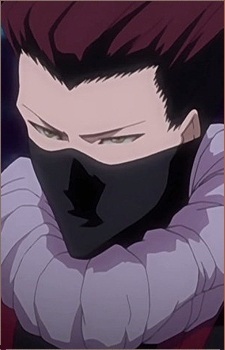 Ryu Kuzu is introduced during The Captain Amagai arc as one of Gyokaku Kumoi's assassins. He is part of the assassination squad set to caught Rurichiyo Kasumioji under Hanza Nukui. He faces against Uryu Ishida. He asks Ishida him about using shunpo, so Ishida reveals that he's a Quincy and so he uses Hirenkyaku instead shunpo. Then, Ishida in asks Ryu about his sword, so Ryu reveals that it's a Bakkoto. He explains that these are different from zanpakutos in that they don’t have a shikai or bankai, and they instead convert the user's spiritual force directly into pure power. Then, Ishida begins his attack. so Ryu increases his power with the use of his bakkoto Shiragari, allowing him to cover the entire rooftop where they're fighting with a dark mist, and shadows of his figure appear everywhere. Ishida tries to destroy all the shadows, but none of his arrows have any effect, and Ryu uses the mist as a cover from which to strike Ishida at vulnerable spots. After having his leg injured, Ishida realizes that his opponent has merged with the mist, and shoots his Seele Schneider into a pentagram shape around the battlefield and activates his technique. Ryu gets caught in the explosion but barely survives. He was later shown witht Kumoi, and reports him about the death of Hanza and his comrades. Kumoi decides he has no more use for him after he failed his mission, and told Makoto Kibune to kill him, revealing that he and Kumoi are in fact allies.